Take grated cheese in a bowl and heat in microwave for 10 seconds, till it melts slightly. Add green chillies, mint leaves, salt, pepper and mix it well. 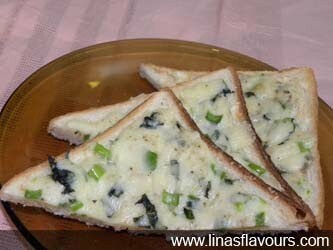 Take bread slices and apply cheese mixture on one side. Toast/Grill it for 4-5 minutes or till it becomes slightly crispy. Mint leaves gives special flavour to the toast. Serve it hot with any soup or enjoy it just like that. You can even grill it in the oven.